Are you remodeling? Then you should not forget to bring out your oscillating tool. You know how things can be so much easier with this kind of tool by your side. Whether you are doing some home repair or an all-out construction, using an oscillating tool can be really helpful. 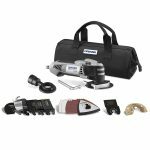 This power tool is designed to help you work on various tasks whether it is cordless or corded. But still, you can do a lot more tasks if you go for cordless since it is more flexible and you can carry it anywhere. So, here are some of the best cordless oscillating tools that you can choose from. 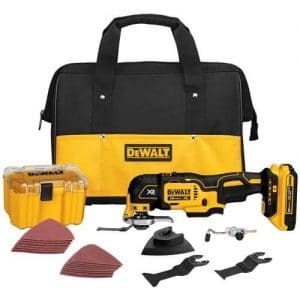 Coming from a well-known brand, DEWALT DCS355D1 Oscillating Multi-Tool Kit is indeed one of the best. This cordless tool uses a powerful brushless motor that can aid comes in handy with a longer runtime compared with other tools. DEWALT DCS355D1 Oscillating Multi-Tool Kit has up to 7 hours run time when fully charged which is perfect for all kinds of projects. Weighing only 3.2 pounds, this oscillating tool is easy to carry around and do up to 20,000 OPM whenever you need it. It is also packed with various oscillating blades that work efficiently when it comes to sanding to cutting. Coming second to DEWALT, Makita XMT03Z Cordless Multi-Tool is perfect for those who already own a kit and other accessories. Even without additional tools, this cordless oscillating multi-tool is proven to be effective and worth its price. 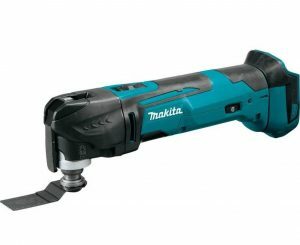 Makita XMT03Z Cordless Multi-Tool is designed to work with different applications thanks to its excellent rubber coated grip. 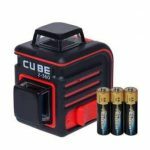 Its ion battery gives it a big advantage as it powers the tool for up to 20 minutes in continuous use. Its variable speed dial also ranges from 6,000 up to 20,000 OPM. Whether you want to cut through metal or sand, this oscillating tool is a pro. If you want an oscillating tool that can hold more than 10 accessories and a whole lot more, PORTER CABLE PCC710B is a great option. 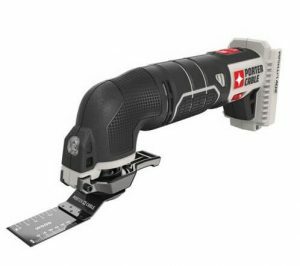 PORTER CABLE PCC710B is one of the best power tools which can be compared with DEWALT in power minus its universal adaptor. This oscillating tool runs at a great speed that ranges from 8,000 to 18,000 OPM. With its complete accessories in one toolkit, you can finish a bunch of work. You can continue to use it with its rechargeable battery for a longer run time. Its impressive over mold grip allows an easy access to the power switch without a hassle. 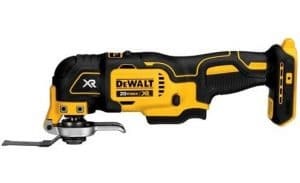 Another oscillating tool form DEWALT with a brushless motor, DEWALT DCS355B Oscillating Multi-Tool is one of the top choices on the market. Aside from the fact that it came from a well-known brand, customers prefer it due to its brushless motor. Even though it lacks the power saving feature that other power tools have, its head blade includes a universal adapter. 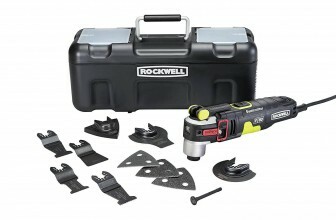 This cordless package comes with a set of durable and versatile tool that can last up to 57% longer run time. Over other power tools, DEWALT DCS355B Oscillating Multi-Tool is indeed impressive with its quick maintenance and worry-free operation. Are you in need of a handy tool that you can use for construction or even in just house repairs? 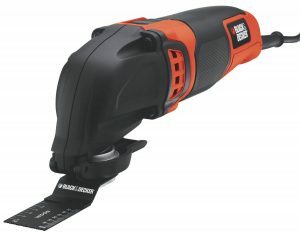 BLACK+DECKER BD200MTB Oscillating Multi-Tool is currently one of the top tools that can help you out. This oscillating tool is not just popular because of its brand but also because of its top-notch speed settings. BLACK+DECKER BD200MTB Oscillating Multi-Tool does not only have 3 but 6-speed settings you can choose from. Its high-quality 2.0 AMP motor runs with great speed that ranges from 10,000 to 20,000 OPM. With its power and features, it is considered one of the toughest power tools today. 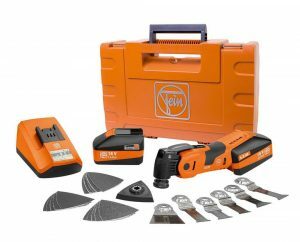 If you want an oscillating tool that is specially designed for personal and commercial use, Fein AFSC18QSL Oscillating Multi-Tool with Case is the one. Even though Fein AFSC18QSL Oscillating Multi-Tool with Case is the most expensive in this list, it’s worth the price. In other words, you really get what you pay for since this power tool offers the famous StarLock Mounting System. Its battery lifespan is longer too compared with other tools so you can use it for hours without charging interruptions. Moreover, it has 50% less noise and 70% less vibrations which makes it easier to control and feel less fatigue. Even though it is true that these oscillating tools can be really versatile, they can still do better. That is if you know the right things to consider when purchasing one. Cordless oscillating tools vary too depending on their brand so here are some things worth remembering. Of course, performance matters a lot since it determines the effectiveness of your oscillating tool. Depending on the brand, you can have two similar tools that draw that same amount of power but produce diverse outcomes. This is because the performance of your tool is also affected by how you use it. As long as you know how to properly use your tool, its performance can improve and lead to great results. Last but certainly not the least; don’t forget to find a tool that is durable enough to last for years. The longer warranty you can take advantage of the better. But aside from the warranty and services you can get from a durable product, make sure that you inspect it personally to see how it feels and looks. Since cordless oscillating tools don’t have a direct electrical power source to rely on, it is important to consider its runtime. This means that you have to check if the battery is capable of lasting for as long as you need it. A standard battery is 18V which can work for straight 4 – 5 hours when fully charges. So, look for an oscillating tool that can work for 5 hours or more for your convenience. This way, you can get your job done without stopping frequently to recharge your battery. Aside from having a long runtime, it is also important that your tool can be fully charged not longer than 30 minutes. The best oscillating tool should work for at least 50 minutes of continuous use when fully charged. The faster it charges, the better. Since all of us prefer to do things the easy way, power tool manufacturers made sure that we enjoy a more flexible tool. Thanks to the cordless oscillating tools, you don’t have to deal with electrical cords to trip on and sockets to locate. The best designed cordless oscillating tools should produce less vibration to make it more manageable and result in less fatigue. Just imagine using an oscillating tool that did nothing but to vibrate like there’s no tomorrow. You will not only strain your hands and arms but also your entire body. Thus, it’s more likely that you will either finish your tasks in record time or postpone it more often to take a break. Another integrated design that the best cordless oscillating tool should have is a bright LED. This will make your work easier since it illuminates your work area especially if you’re working in dim areas. No one really wants a loud tool even though most power tools are really loud. But since modern oscillating tools became available on the market, these tools became in-demand worldwide. The less noise your tools produce, the better. You might not even have to wear earplugs that are designed to protect you from noise pollution during the operation. Most of the time, the noise is also due to the large vibration that your tool makes so look for tools with less vibration. So, are you ready to take a purchase of your first cordless oscillating tool? You may have a lot of products to choose from on the market but can narrow down your search with this guide. You can check out the selected cordless oscillating tools we already reviewed or create your own list based on the top things to consider above. The important thing is you already know what to look for in a power tool and what to expect in the best tools. You can also find other oscillating tools that fit your needs and budget better. Lastly, don’t forget to follow us for more informative reviews about power tools.